Most home amenities are meant to help you unwind after a wearisome day but the level of satisfaction varies significantly. While most comforts can calm you down, few do it better than sounds of nature such as babbling brooks and chirping birds. 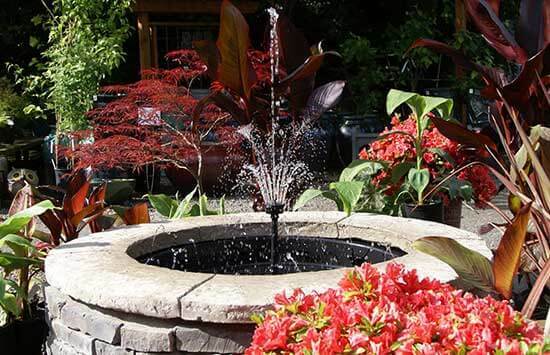 More so, as much as it can be hard to build a nature reserve in your backyard, a fountain can be the next best thing. Regardless of what you might think when you picture complex water features, a fountain is basically a cycle of water. This means you only need to check out small water pumps online for a fitting choice and make a simple sculpture of the fountain you want. Although you may a have a general idea of how to build a fountain, it’s important for you to have the right tools. Other than the pump, you may also need to buy a small preformed plastic container or pond liner if you have none. You will also require some tubing and fountain statuary, a carpenter’s level, a sizeable screen, a PVC pipe and maybe some sand for adjustable flooring. Working with small water pumps is usually quite straightforward but if you would like some unique customizations then you might need to consult some experts. Once you have all the requirements, you will need to dig a pit that is a little deeper and wider than your container. You will then have to add some sand at the bottom of the hole and place the preformed container on top of it and afterwards, using the carpenter’s level, check its levelness. You will be able to level it by adjusting the sand beneath and use the extra to plug the gap left by the container, if any. Dig a shallow trench between the pond and any nearby external outlet. Cut the PVC conduit to the length of the distance from the pit to the outlet and use a string to pull the pump plug through it. Secure the plug to the conduit and lay the setup on the trench with the pump at the center of your container. Place a screen over the pit and mark the area over the threaded outlet and nearest the conduit. Small water pumps are much easier to manage since you will only need to cut out a fitting flap at the conduit mark for easy access during servicing. If you have a statuary that lacks plumbing, you will need to drill holes at the top and bottom and pass the plastic tubing through it then fit it over the pump’s discharge adapter. You can always do without the screen depending on the statue but it may serve you well if you decide to use local materials. After setting up, plug the pump into the outlet and watch the first jet of water shoot up into the air. You may need to adjust the fountain statuary so that the water drops in the middle to reduce water loss. Finally, choose your decorations and enhance the appeal of your fountain the way you had imagined. With these simple instructions, you realize that fountain building is not rocket science hence you can do it with a little time and desire. Even though you may not require much help, you can always consult regarding small water pumps as the project core. https://www.bldcpump.com/wp-content/uploads/2015/05/how-to-build-a-fountain.jpg 355 550 jarred https://www.bldcpump.com/wp-content/uploads/2018/12/Logo-246x156.png jarred2014-09-21 14:14:132016-02-18 16:03:52How to Build a Fountain?